Comet 218229C Steel band brake with ceramic lining. 4.3" Dia. Home > Comet Clutches and Parts > Comet 010961A, B/D W/HUB 4 X 1IN B > Comet 010978A. 4" Band Brake with ceramic lining. 1" Wide. > Comet 218229C band brake with ceramic lining. 4.3" Diameter. Comet 218229C Steel Band Brake with Ceramic Lining. 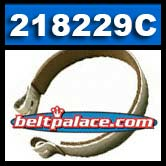 Comet 218229C band brake with ceramic lining. 4.3" Diameter. Comet 218229C Steel band brake with ceramic lining. 4.3" Diameter, approx. 1" Wide. Fits most 4" Comet Industries drum brake systems. Genuine Comet Industries part made in USA! CONTACT US IF YOU ARE LOOKING FOR POWERTEC-HAULER PARKING BRAKE BANDS. THOSE ARE SMALLER DIA. AND WE HAVE SOME LEFT IN STOCK. Comet 010978A. 4" Band Brake with ceramic lining. 1" Wide.